Jay: "I figured out my problem. God hates me." Pam: "Oh, c'mon. God loves everyone." I'm sure that all of us have, at one point, hit rock bottom. Not necessarily financially, but in any situation where your last hope is that there basically is nothing left to lose. At that point, you may also feel like your luck is at it's highest point, and your courage suddenly springs from someplace you didn't know existed. The under-marketed, 1989 sleeper comedy, Let It Ride touches on just such an occasion, offering a day in the life of an everyman whose luck slowly, but surely, begins to change when he least expects it. Jay Trotter (Richard Dreyfuss) is going through a rough spot with his estranged wife Pam (Teri Garr) and feels like he's making very little progress. He feels his luck change when his cab driver friend Looney (David Johansen) plays him a tape he made of people talking in the back of his taxi. One of the conversations is between two people that claim they've fixed an upcoming horse race. Jay decides to take the information seriously, and heads to the track as soon as possible. As he meets up with all the gambling-addict regulars he considers friends, he decides to bet on the fixed horse; a longshot at best. When he wins, though, his day begins to take on an almost epic quality. Could he indeed become rich by simply hanging around the track all day and betting on horses? Or will it just ruin his marriage even further? He soon discovers that, out of the weirdest circumstances, come the most unusual friends and supporters, and his day becomes very interesting. Let Ride is a fast paced, diverse comedy that really has no storyline or specific happenings; it's just a guy at the race track trying to have a good day. A host of unusual and memorable characters surround our Jay Trotter, and as a result, we get a lot of well used comedy potential. The film is by no means realistic, and pretty much takes place in its own, strange world where just about every face at the race track is some kind of exaggerated personality. Great comic performances abound, and Dreyfuss does a great job playing off actors like David Johansen and Robbie Coltraine. Teri Garr gives a small, but effective, performance as the tattered and frustrated Pam, bringing back the chemistry that Garr and Dreyfuss shared as the frazzled couple in Close Encounters Of The Third Kind. I suppose Jay Trotter is not so much a hero as he is a lovable jerk that takes on the hero's mantle when he gets some big breaks everyone else wishes they could get. Regardless, some clever writing and dynamic direction turn this simplistic setting into a fun, silly comedy that's uplifting without being condescending. While the main thrust pokes fun at habitual gamblers, a subject not very funny in real life, I think it does so without glorifying gambling. If anything, it provides a fairly accurate view of people for whom life is just day after day of taking risks to win a big-payoff, good or bad. If you like movies where you root for the underdog (and, no, I don't mean the endless "unpopular sports team" dramas), Let It Ride is your best bet, no pun intended. Image Transfer Review: I was pleasantly surprised by the outstanding transfer offered here. Aside from some grain and very minor movement in a few backgrounds, the film is beautiful in all respects. I was worried that, with the continuously varying types of photography, the transfer would be a disaster, but it handles everything like a champ. The smoky, moody barroom scenes are appropriately rendered, with wonderful neon color and sharp black-level/shadow definition. But then, it can switch over to the brightly lit areas of the race track, complete with sunset views and grassy parks and bring out every inch of detail there. I detected no hints of artifacts or pixelation, and the anamorphic enhancement does not bring out exaggerated aliasing distortion (or 'jaggies'). Very impressive for an 11-year-old feature. Audio Transfer Review: While the Dolby 5.1 mix is not super-active or adventurous, it succeeds in adding a great, overall ambience to the film. The front channels provide a very immersive experience by using a lot of stereo material and extremely well handled dialogue, that always sounds very crisp and balanced. Surrounds are used on a regular basis to enhance a variety of crowd noises and other background sounds. The 2.0 sound mix lacks the same kind of clear, surrounding spatiality, but sounds acceptable for what it is. Extras Review: Other than English captions, the only other feature is a 4-minute promotional short on the making of the film. It features some basic interviews with most of the central cast, but fills itself with a little too much footage from the actual movie. It makes a nice little addition to the disc, but it's nothing special. The featurette is full-frame, mono sound, and of fairly weak video quality. Chapter stops are adequate and an insert with a listing is provided. 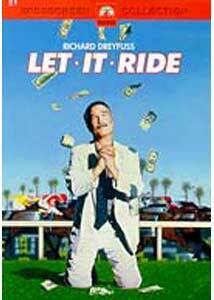 In an age that, to me, seems to have less and less clever, sharp comedies, Let It Ride is like a textbook example of using very little to make a lot. I hate to use the term 'cult-classic' in this case, but that just may be where it fits in best. While not a special edition, the DVD certainly delivers a solid version of the film that enhances the enjoyment. Definitely recommended.